People's patience for a cumbersome and clumsy mobile site or app is waning. They expect to move through a brand’s mobile experience at lightning speed. There are a few simple steps marketers can take to eliminate speed bumps and ensure every customer’s need for speed is met. Immediate gratification: It’s not just for toddlers anymore. Mobile has trained all of us to expect to get what we want, in the moment we want it. We expect brands to be there in those micro-moments when we are looking for local businesses, researching a product, or looking for instructions. In fact, 60% of online users say that thanks to online research, they make purchase decisions more quickly now than they did a few years ago.1 For brands, these micro-moments are crucial, and they happen in a split second. The good news is that streamlining your mobile design starts with a few simple steps. 1) Eliminate Steps. If speed thrills, friction kills. Which is to say, your mobile functionality matters. 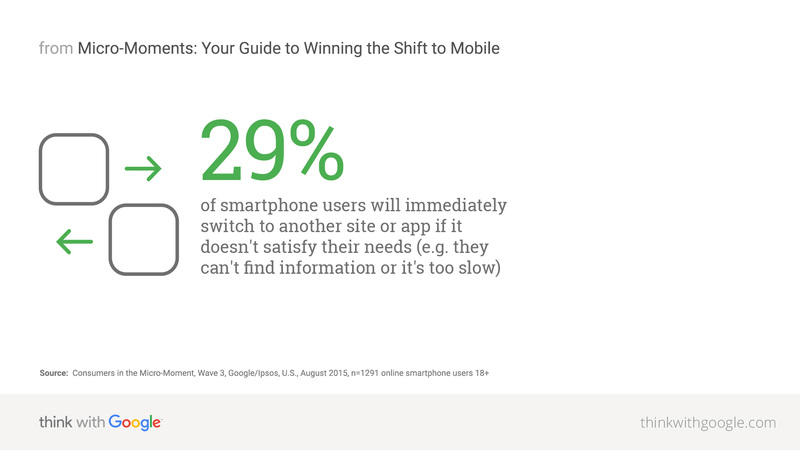 And the more steps you have in your mobile experience, the more likely a user is to make an error. Consider Progressive’s recent success in eliminating steps for its customers on its mobile app. Progressive Insurance recently implemented a strategy that presents customers with next steps at nearly every turn. For example, if a customer has just filed a claim, they're presented with its status and a click-to-call link to contact their agent. Or if they have an upcoming bill, they’re presented with a simple pay-now button. Anticipating that filing a claim on mobile was a need for its consumers, the team at Progressive looked at its analytics and realized that people were dropping out early in their 24-step claim filing process on mobile. With creativity and teamwork, Progressive reduced the mobile claim process down to just five screens. The result was a remarkable seven-fold increase in claim submissions and a 35% rise in the start-to-finish rate for claim submissions in the app. 2) Anticipate Needs. Being quick is knowing what your customer wants before they want it. Put the calls-to-action for the primary activities in a prominent spot on your homepage, with secondary actions hidden behind menus. Virgin America recently focused their mobile experience on one simple call to action: "book a flight." They made room for a single call to action by steering away from offers or distractions that clutter the booking process. Today, their mobile customers can book a flight twice as fast. For real estate company Zillow, anticipating needs meant implementing a GPS-based search feature on its mobile site and app to allow house hunters to find listings nearby in just a few taps. The result was more homes being viewed per session. Plus, remember this: If someone has already been to your company’s mobile site, made a purchase, and/or left items in their shopping cart, you already know a lot about their needs. Segment your customers by their past behavior and you can present them with the right messaging, direct them to your call center or store, and make their experience even more frictionless. 3) Load Time Really Matters. Here’s the truth: The most thoughtful mobile UI in the world will still fall short if your mobile site takes too long to load. Meet these high expectations by keeping your technical backend up to snuff. Not a coder? No problem. Check out the PageSpeed Insights tool to rate your site’s load time and generate custom recommendations to increase your site’s speed. Analyze the mobile performance of your site compared to your desktop site too. Share this report with your technical team to help them with ideas and concrete steps on what to improve. To see the benefits of faster load times, check out what Walmart did. In fall 2014, visitors to Walmart’s mobile site were confronted with a blank screen for 7.2 seconds before content was loaded. In just under a year, the company reduced page load time to 2.9 seconds. 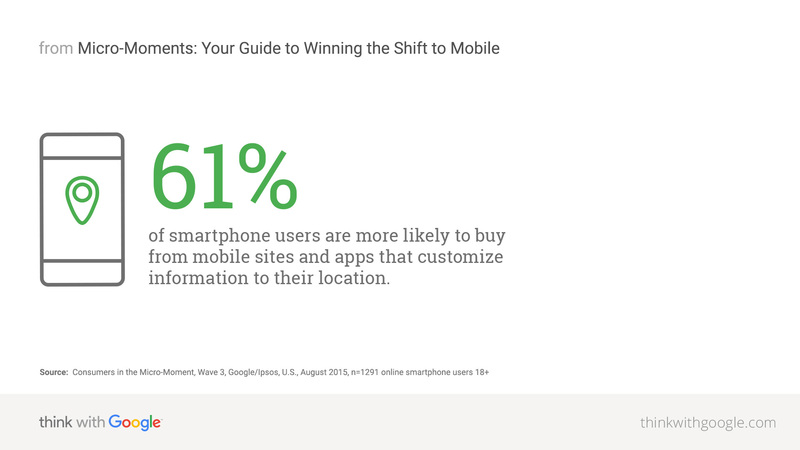 What is the key action you want users to take on your mobile site or app? How long does it take to perform it? If it's more than a few minutes, it's time to streamline. 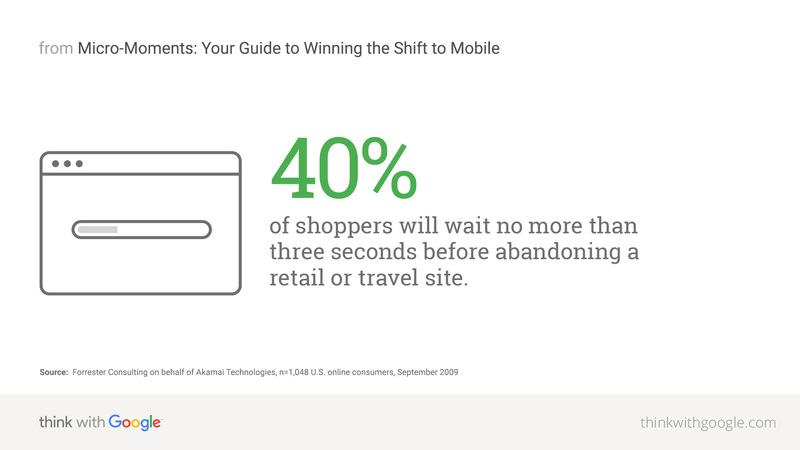 Which functions on your mobile site are absolutely, positively, undeniably essential for your customer? What do you already know about your customer that can help you anticipate their needs? How long does it take for your site to load? The PageSpeed Insights tool can help you know how to engage your technical team on improvements.